I’m really hoping they don’t kill Leia off. I want at least one of the big three to just be able to retire happily rather than dying for the cause. We’ve already had two die for the cause. I want Leia to have stepped back with her head held high, convinced she’s paid her dues for the cause, and ready to leave everything in the capable hands of the next generation. Then I want her to retire to the Star Wars equivalent of Risa and spend her remaining years being tended to by a hunky cabana boy. Although Luke’s characterization in the film is almost certainly inconsistent with his characterization in Return of the Jedi, this is forgivable because of the vast time difference between the two films. Luke’s astral projection across the galaxy was a creative idea which aptly illustrated his mastery of the Force. His vision of the binary sunset before his death was beautiful. Leia’s flight through the vacuum of space was almost unintentionally comical, but I could forgive this were it the only major flaw in the film. I will not criticize the humor because other Star Wars films have struggled with the appropriate level of comic relief. By far the worst character in the film is Poe Dameron. The writers should have killed him off in the crash landing on Jakku in The Force Awakens. His reappearance in the film is utterly illogical. In earlier drafts of the script, Poe died in the crash landing on Jakku because his purpose to the story was fulfilled. In later drafts, J. J. Abrams wrote Poe back into the story despite implying he died on Jakku. Thus, despite his insistence on returning to Jakku to retrieve BB-8, he inexplicably leaves Jakku without it. In The Last Jedi, Poe Dameron is a thousand times worse. He consistently disregards the chain of command and lacks respect for authority. He disobeys Leia and in the process needlessly causes innumerable resistance fighters to die but is only demoted, essentially a slap on the wrist. Later, he even plans a mutiny. Yet Leia and Holdo speak fondly of him. In real life, after Poe’s first offense he would have been dishonorably discharged. After his attempted mutiny, he would have been executed for treason. I hated Poe in The Last Jedi even more than Anakin in Attack of the Clones. While I could not empathize with Anakin, I could at least pity him because he was born a slave, was separated from his mother at a young age, and saw dreams of his mother in agony. In contrast, I was longing for Poe to die throughout the entire film. Rey is an intriguing character, but her story would be so much more compelling if she faced failure. In the Empire Strikes Back, Luke was unable to lift his X-wing from the swamp. When Yoda lifted it for him, Luke was able to learn from failure. Vader bested Luke in combat and cut off his hand. In contrast, Rey bested Luke in combat. After two films in the trilogy, Rey never suffered a serious failure. The ghost of Yoda declared the moral of the story is learning from failure, yet the protagonist never wrestled with failure herself. Finn should have died sacrificing himself to save the Resistance, a heroic act which would have been a perfect end for his character arc. In The Force Awakens, his goal was first to run away and save his own skin and then to protect Rey. Dying to destroy the canon and save the Resistance would have been a perfect end for him. Instead Rose stopped him from sacrificing himself. Her remark that they will win not by fighting what they hate but by saving what they love was a ludicrous cliché. Not all hatred is evil. All wars require sacrifice to vanquish the enemy. Whereas Disney was unwilling to kill off any of the new heroes, it is willing to kill off one of the most intriguing villains in the saga. Snoke was not a Sith yet was more powerful than any dark side force user. He resurrected the First Order from the ashes of the Empire, and he seduced Kylo Ren to the dark side. The Force Awakens and The Last Jedi hint at a compelling backstory for Snoke but never deliver. The revelation Rey’s parents were nobodies was neither shocking nor disappointing. It was practically expected for her to be a Skywalker, and it is unsurprising Disney would subvert audience expectations. At least the script provides a backstory for Rey, unlike for Snoke. Rey’s vision in the netherworld of Ahch-tu was disappointing, especially when compared to Luke’s vision of Vader in the cave on Dagobah. Her vision of an infinite number of Reys revealed nothing unique regarding her character. Lastly, it is difficult for me to regard Kylo Ren as a serious villain. He is undoubtedly evil, but he is not as formidable as Vader or Sidious. *Note: When ranking the original trilogy, I am evaluating the special editions. You are you telling me the resistance has no refueling ships anywhere they can reach out to? I would also be assuming refueling would be done while flying (much like it can be done here on earth) so the FO would be able to do as much about the refueling ship as they were able to do to the other ships. Nobody answered their distress call. Who was going to refuel them? Robot Chicken notwithstanding, we’ve never seen a gas station in Star Wars. Where were they going to refuel if the First Order hadn’t tracked them through hyperspace? Could someone have gone there to pick something up? I guess not. Another thing that I thought strange was why the fleet didn’t just split up? Only one First Order ship was tracking them so if they all went their separate ways then surely most would have escaped? And the ships that ran out of fuel and got destroyed… was any effort made to transfer their crews to the bigger ship via shuttles or something? Why didn’t the first ship to run out of fuel do the kamikaze lightspeed trick? Does anyone knows the site offering the same…??? And the ships that ran out of fuel and got destroyed… was any effort made to transfer their crews to the bigger ship via shuttles or something? Tell that to the Pigman ROTJ Luke choked. Luke fell to the Dark aside? True, but at least the Ewoks were put to better use. All that thing did in TLJ was hang around and look cute. Sorry, Warb, but I’m gonna have to disagree with you on all of these. Well, I don’t disagree that there are no real lightsaber fights. I freely admit that. But I loved the fact that there wasn’t. I’m so sick of the formula of them. Luke’s non-fight with Kylo was better and more impressive than any actual fight could have been. I didn’t think it was all that impressive. It’s a Star Wars movie. There should be a lightsaber fight. As for the rest, I dunno, it made perfect sense to me. You mentioned something about your viewing experience, but I don’t know what thread it’s in. It is in the b****ing thread in the off topic section. All I can say is that it wasn’t obvious to me, especially the cause of Luke’s death. to me what was going on the MOMENT Luke appeared on Krayt. I guessed immediately that he was just a vision too, especially given how different he looked. But I thought that whole idea was fantastic, that Luke completely demoralized the First Order without resorting to any measure of violence. He simply outsmarted them. That was probably my favorite part of the whole movie and made The Force feel truly mystical to me for, really, the first time since the original film. the important detail(s) explaining what Luke was doing and whatnot. It wasn’t there. It was clearly shown that he did not interact with the salt. EDIT: Not sure about the image policy, so I’ll just put them in quotes and pretend that it makes a difference. Maybe some people are super duper observant, but that’s a detail which I doubt many people noticed. And frankly, it isn’t an important detail. It was a nice touch but that’s it. I agree, but it is there. Regardless, it doesn’t matter, because it doesn’t need an explanation in the first place. It doesn’t? Sorry but I like to know what the heck is going on when I watch a movie. We are talking about the death of Luke f-ing Skywalker. There shouldn’t be any confusion over his death. I didn’t think he died from exhaustion, I thought he made the decision to become “more powerful than you can possibly imagine” and moved to that next plane voluntarily. He was done with the crude matter of his body, and he cast it off accordingly. Anyway, I’m fine with that ambiguity because I think it feeds into the mystery of the legend of Luke Skywalker. Different viewers are going to walk away from that with different interpretations. I’m sure the stablehand’s story at the end is pretty embellished and colored by what that kid does and doesn’t know about Luke. What you walk away with depends largely on what ideas about Luke Skywalker you’re bringing to it. ^ more proof that the cause of his death was unclear. Don’t you remember how Obi-wan died but somehow the saber didn’t even touch him and even Vader looked confused, and this weird mystical occurrence ruined the whole movie. I think it’s just because the trilogy wasn’t planned out. JJ thought that Rey’s parents should be important, Rian felt differently. Sadly, I think that’s entirely possible. Lucas went that route in his six films and to varying degrees depending on who you ask, it weakened the franchise and most certainly fractured the fan base. Lack of planned story isn’t a good thing. I’m one of the loudest proponents of her being Rey Random. It’s the very universe expansion I’ve wanted for decades. I hope they stick with it. The ship could be someone leaving after they’ve killed or taken her deadbeat parents. There are all sorts of ways that fleeting scene works with a Rey Random story. Fingers crossed JJ does it justice. He has an appreciation of the history of the franchise. I suspect he doesn’t want to trample on it. It’s the Rian tell part of a story game aspect that’s disappointing. I don’t have a problem with Luke as an older and different man 40 years after we first met him. In fact, I expect it and welcome it. His less than friendly relationship with Rey is the best part of the film. That said, I found the shoulder toss of the light saber to be completely deflating after the weight we were left with in the last scene of TFA. In the few times I’ve watched TFA this past year, after Rey meets Han, I skip ahead to that last scene. I thought it was done perfectly. I don’t anymore. For me, the emotional depth of that last TFA scene was ruined when it goes from serious to shoulder toss let’s go milk a sea monster in a matter of moments. WTF Rian? Luke can certainly be dismissive of The Force. After 40 years of what he views as a misguided trust in it, that’s a totally valid and interesting story direction. I just don’t buy that he would flippantly toss aside something that was such a big part of his earlier life. He lost his only family and several friends in the first film, learned more\lost more in the second, then grew emotionally, saved millions of lives, and redeemed Vader in the third. He could have respectfully handed it back to her and expressed why he dismissed her ideas and her quest. Rian instead went for shock value over depth and emotion. That was very disappointing for me. I thought he was using a Jedi mind trick there. The saber toss thing was stupid. I agree with you about the problems of not having a plan. And - I suspect - one will be on my desk at work before long. 😃 I have no idea why those don’t bother me. 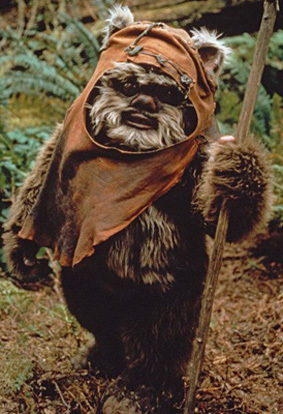 Particularly since the Ewoks made me want to get up and walk out of the theater in 1983. I found the Porgs to be interesting as well as a welcome diversion from Labyrinth ladies and sea monster nips. But while I had correctly guessed, I wasn’t committed to it. I wasn’t sure if I was right. Therefore, I was totally in the moment when all of those things happened, and I was genuinely scared when both of those attacks happened. And then when I realized I had been right, which is exactly when the movie wanted me to know I was right, it was very satisfying. That’s EXACTLY how it was for me also. I suspected, wasn’t sure, then excited about what Luke had done.